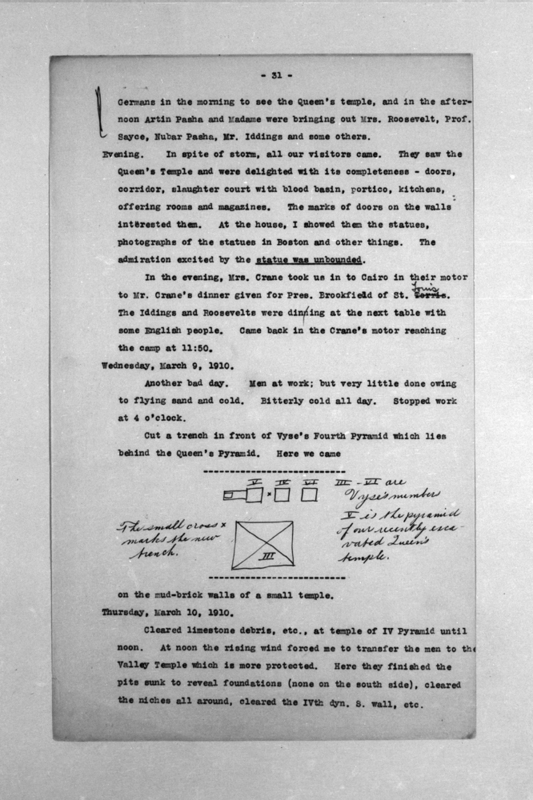 Germans in the morning to see the queen's temple, and in the afternoon Artin Pasha and Madame were bringing out Mrs. Roosevelt, Professor Sayce, Nubar Pasha, Mr. Iddings and some others. Evening. In spite of the storm, all our visitors came. They saw the queen's temple and were delighted with its completeness - doors, corridor, slaughter court with blood basin, portico, kitchens, offering rooms and magazines. The marks of doors on the walls interested them. At the house, I showed them the statues, photographs of the statues in Boston and other things. The admiration excited by the statue was unbounded. In the evening, Mrs. Crane took us in to Cairo in their motor to Mr. Crane's dinner given for President Brookfield of St. Louis. The Iddings and Roosevelts were dining at the next table with some English people. Came back in the Crane's motor reaching the camp at 11:50. Another bad day. Men at work; but very little done owing to flying sand and cold. Bitterly cold all day. Stopped work at 4 o'clock. on the mud brick walls of a small temple. Cleared limestone debris, etc. at temple of fourth pyramid until noon. At noon the rising wind forced me to transfer the men to the valley temple which is more protected. Here they finished the pits sunk to reveal foundations (none on the south side), cleared the niches all around, cleared the Dynasty 4 south wall, etc.